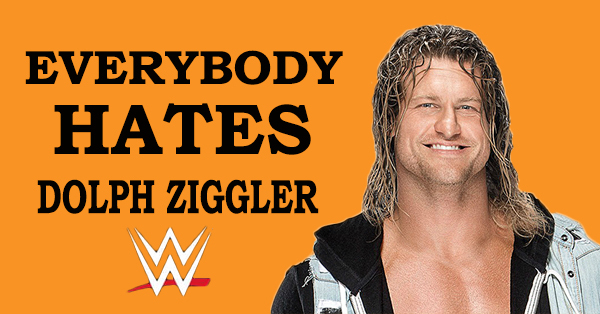 Headlies: WWE Unveils New Network Show “Everybody Hates Dolph Ziggler” - WrestleCrap - The Very Worst of Pro Wrestling! Hollywood, FL – WWE CEO Vince McMahon announced at a press conference earlier today that the newest original programming on the WWE Network would be a reality show called “Everybody Hates Dolph Ziggler”. McMahon, flanked by his daughter Stephanie and Ziggler himself, explained the premise. “We have Dolph Ziggler going around the country and tape people saying awful things about him!” laughed McMahon. “Don’t you get it?” asked McMahon. “So…you’re spending thousands of dollars sending one of your hardest working wrestlers all over the country just so people can be mean to him?” asked one reporter. “Fine, I’ll start it off. Dolph, you smell!” yelled McMahon. “Your hair looks like old Ramen noodles!” said Stephanie. “No one knows if you’re a face or a heel!” shouted someone from the back of the room that sounded a lot like Triple H.
“What about the ‘Be A STAR’ program?” asked a second reporter. “We think in this case that it’s perfectly fine to bully Dolph,” said Stephanie. “Are you worried that Dolph may leave the WWE once his contract is up and go to, say, New Japan?” asked a third reporter. A surprised murmur grew in the crowd. Ziggler mumbled something unintelligible, causing the reporters to ask him to repeat himself. “First dibs at catering, 6 months of improv lessons, and a starring role in the next WWE Studios movie,” said Ziggler quietly. Tell them the name of the movie,” implored McMahon. Ziggler sighed and said, “Everybody Hates Dolph Ziggler: The Movie”. “AHAHAHAHAHAHA!” laughed McMahon, his fist pounding on a table, as Ziggler wiped a single tear from his eye. 3 Responses to "Headlies: WWE Unveils New Network Show “Everybody Hates Dolph Ziggler”"
I may be in the minority, but I’m not really a big Dolph Ziggler fan. I find him boring and monotonous. He may be a hard worker but I don’t get the fascination with him. His “charisma” comes off as forced, he doesn’t strike me as a particularly fun or interesting person…even coming off as a bit stalkerish, and he doesn’t seem strong enough to carry a match on his own. I thought he was more entertaining in the Spirit Squad….at least he had 4 other goofs to play from.